Where else can you drink a Leitmotif? Nowhere, that's where. Exhibit A Brewing has garnered attention for dedication to their craft and for a healthy dose of experimentation. 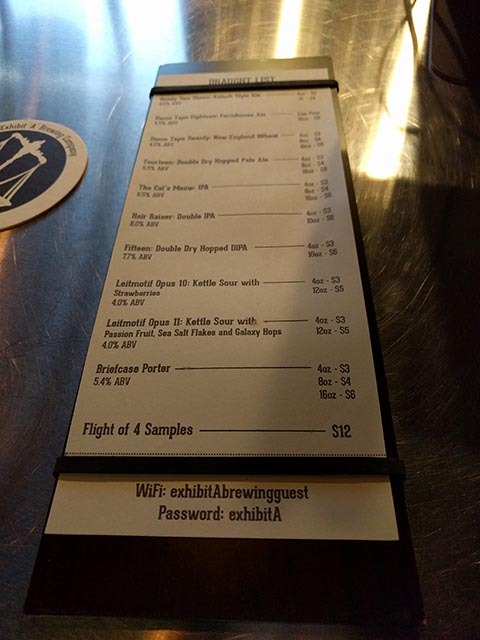 You could do far worse than stopping by their Framingham (MA) taproom. Pants is a big fan of Exhibit A. 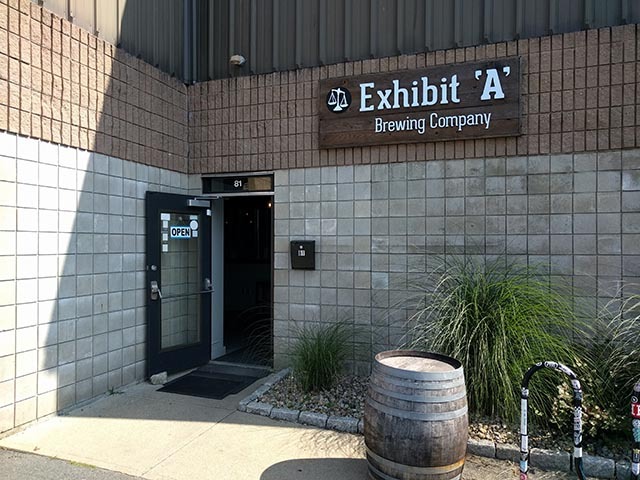 Where is Exhibit A Brewing located? 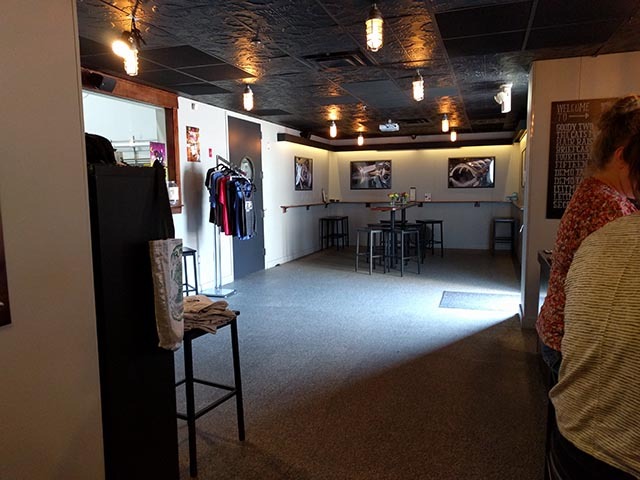 Exhibit A Brewing Company has taken over the old Jack’s Abby space in Framingham, Mass, just off Route 135. 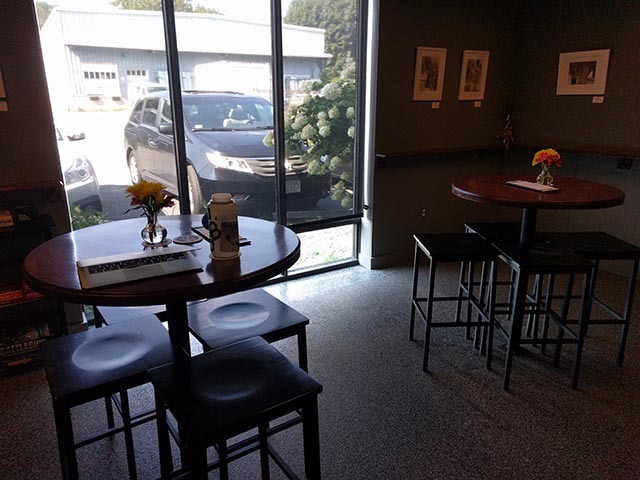 And in doing so, it became part of a small craft beer scene in Framingham with the aforementioned Jack’s, Springdale Barrel Room, and John Harvard’s, a restaurant/brewpub up by the Natick Mall. Late 2016. Matthew Steinberg worked at several New England breweries before getting the opportunity to hang his beer shingle on Morton Street. It seems as though Exhibit A is trying to elevate their production into and through 2019. Yes. They are also hosting a Keg talk series which sounds pretty cool. Definitely considering attending one at some point. Probably worth your time if you have the ability to commute to their Framingham taproom. Check out Keg Talks at Exhibit A Brewing (with the help of Craft’d). The talks will dive into brewing, craft beer culture, techniques for home brewing, food pairings, aromatics, and of course, tastings. Baby changing stations in the bathrooms, FTW! What types of beer does Exhibit A brew? I enjoyed a Briefcase Porter (if you like coffee, this is for you), Leitmotif opus: 10 - kettle sour with strawberries (nice aftertaste), The Cat’s Meow - IPA (light and mellow), Demo Tape 20 : American wheat ddh (double dry hopped). They love their hops, like most brewers these days. So, Exhibit A definitely offers it’s fair share of IPAs and Pale Ales. They also mix in a Kolsch, some sours, porters, wheat beers, etc. They run the Demo Tape series to showcase Exhibit A’s commitment to experimentation and creativity. Sometimes these featured beers get escalated to repertory player status, like the Demo Tape 12. One beer that was exceptionally tasty was Cake. It was brewed with 150lbs of My Grandma’s Coffee Cake and you can tell, as the pastry flavor really comes through. Also, it was their first nitro tapped beer. Step right up to the bar and get your growlers filled. You can definitely leave Exhibit A with (closed) beer in your hand. Don’t be that guy and walk out with your pint glass. Socks. Koozies. Tank tops. T-shirts. Does Exhibit A Brewing serve food? Otherwise, you can bring in food from local establishments. Games in the back room. 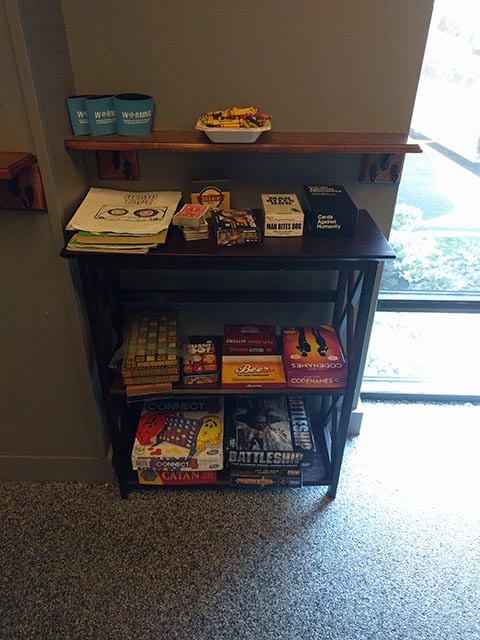 They have Cards Against Humanity, Battleship, Connect Four, Settlers of Catan, and more. Basically, Exhibit A has enough games to keep your kids busy while you enjoy some of their tasty (and experimental) craft beers. Birthday parties, baby and wedding showers, company outings, etc. Can I buy Exhibit A beers in stores? Of course. They can be found all around Metrowest. It’s set in an industrial part of town, so street parking should be available. 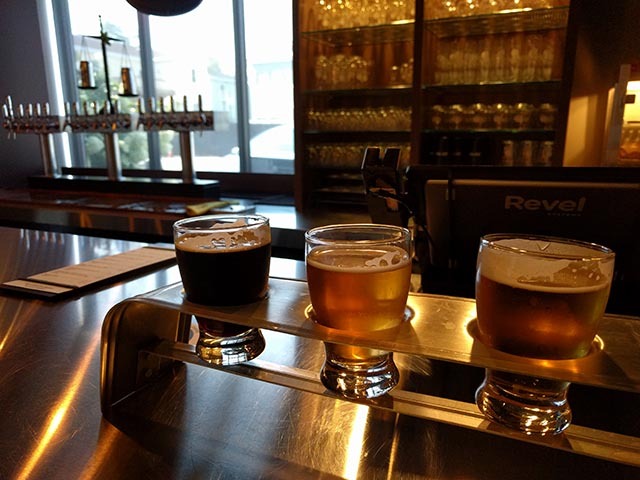 Owner, Steinberg runs a smooth operation, with classy, modern touches on not only how a brewery’s taproom should look, but how a brewery should operate from an experimentation perspective. They were just about to celebrate their 2nd anniversary when I stopped by with live music, games, beer, and a cookout. 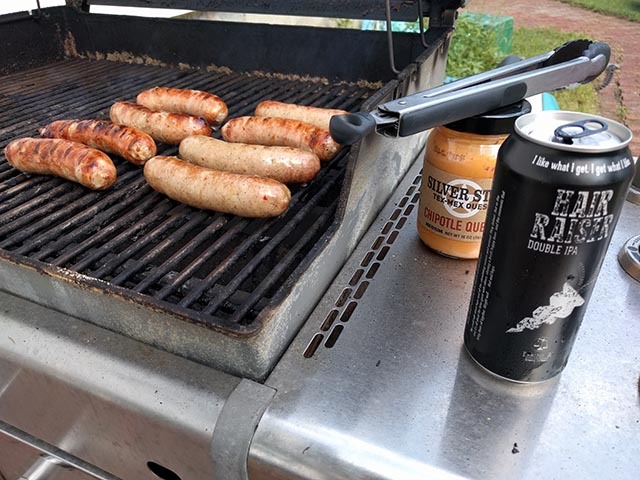 I couldn’t go, so I took home a few Hair Raiser DIPAs and had a cookout of my own!